This is a truly amazing trip, irrespective of your religious belief. 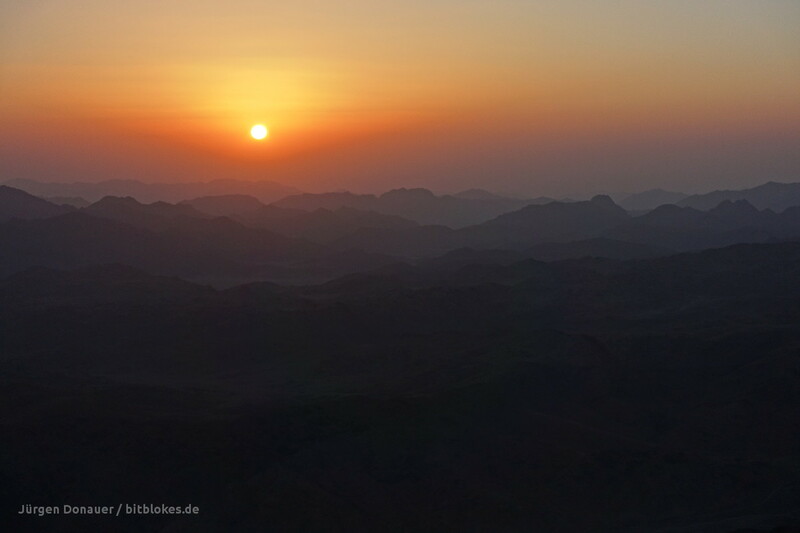 First you will climb to the top of Mount Sinai to watch the sunrise, followed by a visit to the St. Catherine’s Monastery. You will leave from the hotel at 23:00 for the 2 hour journey to St. Catherine’s. The summit of Mount Sinai lies at 2,285 meters (7,798 feet) and it is said that this is where Moses received the 10 commandments. This belief has attracted pilgrims to this mountain for thousands of years. Walking up the mountain should take about 3 hours, depending on your pace and fitness. There is plenty of time to have a little rest along the way. Upon reaching the summit of the mountain, find yourself a comfortable spot to wait for one of the most breathtaking sunrises you might ever experience. After climbing down again, you will visit St. Catherine’s Monastery. The Greek Orthodox St. Catherine’s Monastery, built between 527 and 565 AD, is one of the oldest working monasteries in the world as well as a UNESCO World Heritage Site. The Monastery houses the second largest collection of ancient manuscripts in the world as well as the world’s best collection of early icons, some of which are on display in the museum. 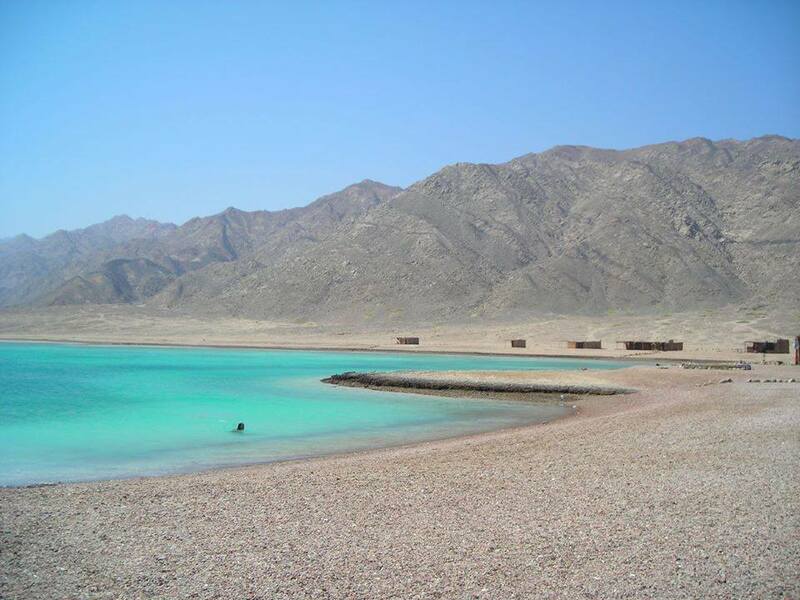 Ras Abu Gallum is a Managed Resource Protected Area which lies north of Dahab. From the hotel you will be driven by jeep or minibus to the famous Blue Hole dive site. From here your journey will continue by camel or on foot for an approximately 90 minute journey along the stunningly beautiful rocky coastline to Ras Abu Gallum. Here a traditional Bedouin lunch of fish, rice and vegetables will be served while you relax and laze around on cushions in Bedouin ‘arishas’ (huts). After lunch you will have time for swimming, snorkeling or just simply relaxing. You will head back to the Blue Hole in time to enjoy the sunset and a drink before returning to Dahab by jeep. The Coloured Canyon presents some of the most spectacular rock formations with the most extraordinary colors you could wish to find. From the hotel you will travel by jeep through magnificent desert landscape until you reach the mouth of the canyon. (The last part of the drive is a bit rough, but not uncomfortable). At the mouth of the canyon you need to climb down for about 250 meters to the canyon floor. Now you will have a mostly easy walk ahead of you for about one and half hours. Take time to look at the magnificent colors of the canyon walls, which in places are almost 20 stories high, as well as the different rock formations which are made up of sandstone, limestone, granite and veins of basalt. We will stop for lunch in a beach side cafe in Nuweiba where you will get the chance to cool off in the sea and do some snorkeling. After this we will head back to Dahab. This is a fantastic trip where you will get the real feeling of being in the desert. We will depart from the hotel at around 11.00, drive north towards Nuweiba, then venture inland into the heart of the Sinai. Approximately 60km before Mount Sinai we will have a traditional Bedouin lunch with our Bedouin hosts for the trip. After lunch we will be taken by jeep or pickup into the Arada Valley, where the first leg of this desert adventure will begin. 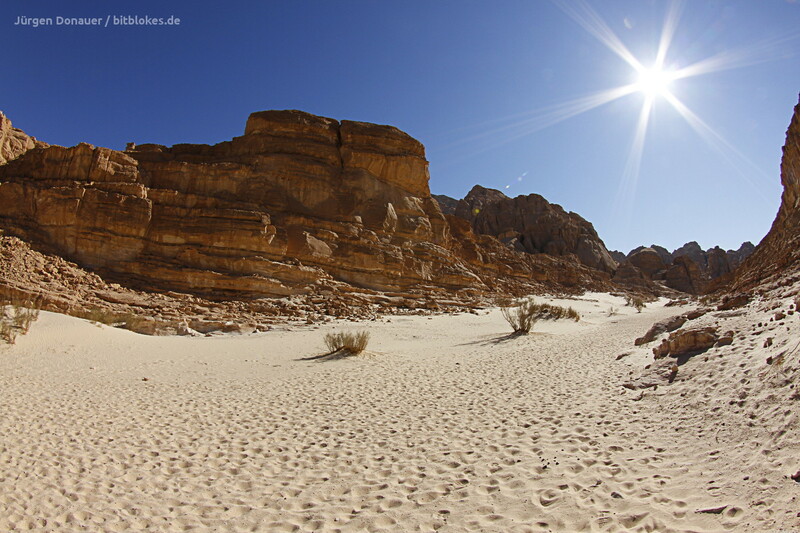 Few environments in the world can prepare you for the ferocious natural beauty of the Sinai desert. Our first stop will be at a big canyon, which we will explore. You will have time to look at, and climb through, the dramatic rock formations which have been created by erosion. We then head off to the famous ‘Rock of Inscriptions’ which is said to bear the signature of the travelers who were lost in the desert with Moses 1000’s of years ago. Late afternoon we will head to our camp, or ‘Hotel under a Thousand Stars’, where Fareeg, our Bedouin host will prepare a traditional Bedouin meal on the campfire. On the second day we will wake up early and have a typical Bedouin breakfast of fresh bread (prepared in front of us on the open fire), falafel and foul, supplemented by fresh fruit and yogurt. Our first stop of the day will be to see the Nawamis. Nawamis are circular sandstone tombs with openings facing west. These mysterious prehistoric structures are thought to be built by the Nabataean, who also built the famous ancient city of Petra. They can be dated back to the Chalcolithic period (Copper Stone Age) of about 4000-3150 BC. Coloured beads, shell bracelets, tools and bones found inside the tombs by archaeologists, are believed to be funeral offerings. The area we visit has more than 30 Nawamis. 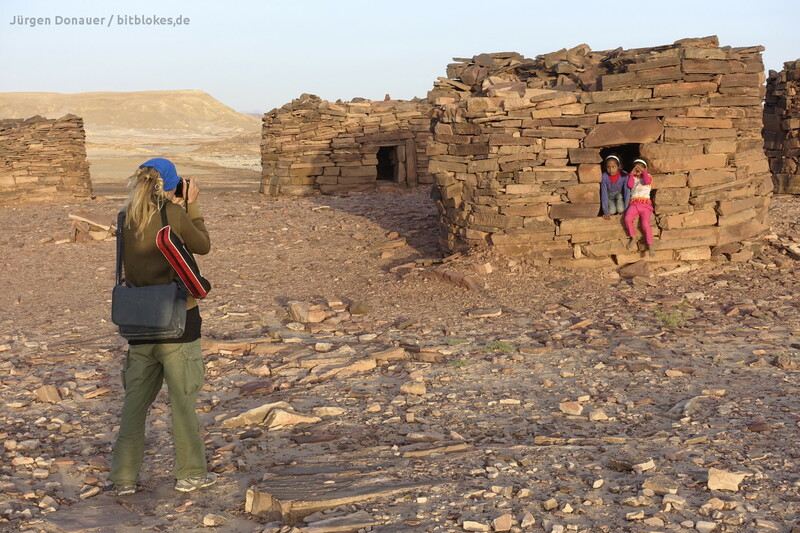 On our way to Hodra Oasis we stop at the famous ‘Sand Dune’ which you can climb and then run or slide down. This is really great fun! Hodra Oasis is a natural water source found long ago by the Bedouin. Much needed water for the Bedouin living in the area, as well as for plants, is supplied from this oasis. After a lunch at the Bedouin settlement we start our return journey to Blue Beach Club. The main attraction of this area is the Mangroves and the unspoiled beauty of an area which extends to about 600 square km. We depart from Blue Beach Club at 09:00, drive towards Sharm El Sheikh for about 40 minutes, after which we will drive through a Wadi (valley/dry riverbed) towards the coast. Upon arrival at Nabq we will be served tea prepared by local Bedouin. You can now decide whether you would like to swim in the lagoon, snorkel around the wreck or take a walk along the mangroves. This stretch of mangroves is about 4,8km in length. The mangrove plays a very important role in the survival of the wild life in this area. This fragile ecosystem supports more than 130 plant species as well as numerous types of birds and other wildlife, some of which you might be fortunate enough to see. After a hearty lunch prepared by the Bedouin, we will head back to Blue Beach Club. This Bedouin style dinner in the desert is an experience not to be missed. We will depart by jeep from Blue Beach Club and travel to a nearby Wadi (valley/dry riverbed). Here in the ‘Restaurant of a Thousand Stars’ you will be able to lie back and watch the millions of stars overhead which at times seem so close that you feel you can touch them, and simply enjoy the peace and tranquility of the surroundings. 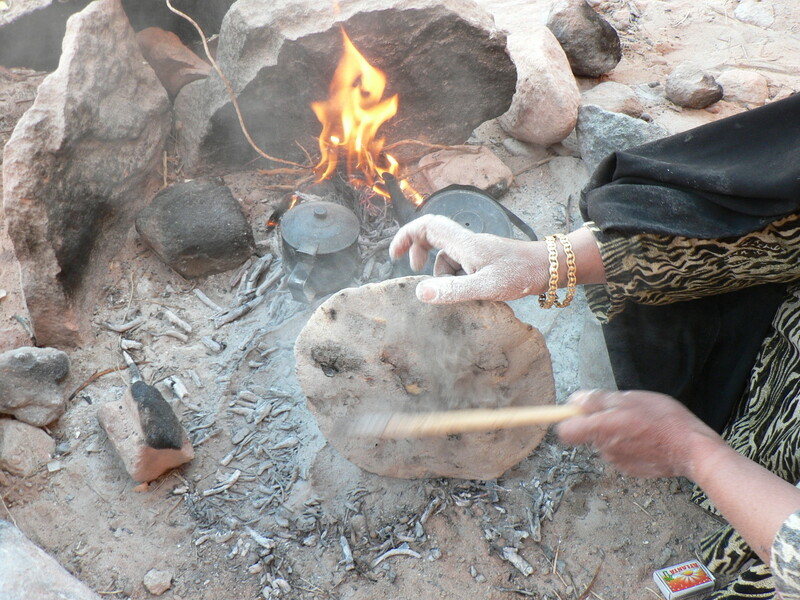 The typical Bedouin meal is prepared over an open fire, which gives the food a very distinctive and delicious taste. There will be a choice between fish or chicken and some vegetarian options too.